Probably the two thing that everyone asks about the most. Typically in EV conversions, a series wound direct current (DC) motor is used. Many years ago, used airplane starting motors were used. Nowadays with a quick Google search you can find hundreds of different motor options on EV conversion websites. I started hunting for a motor with a tight budget in mind and I ended up finding a used motor from the east coast USA somewhere. Apparently it came out of some sort of industrial equipment. It is rated for 72V. However, when it arrived I soon realized that it is not a series wound DC motor. Instead, it is a separately excited (sepex) DC motor. What does this mean? In a series wound DC motor, controlled current goes through the armature windings and then through the field windings. The same amount of current goes through both windings at all times because they are hooked up in series. In a sepex DC motor, the armature and field windings are controlled/powered separately (hence the name). Most of the current goes through the armature windings. The field windings are wound much finer than in a series wound motor and requires much less current than the armature, but requires a separate control device. 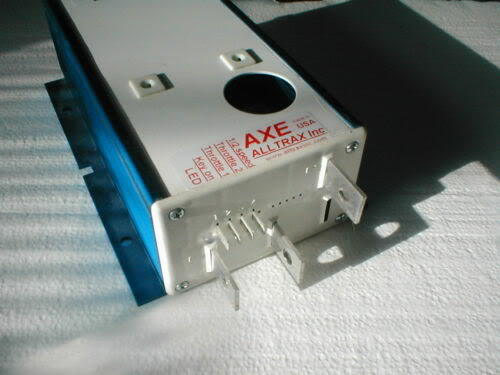 Unfortunately, I had already purchased a used motor controller off eBay, an Alltrax 7245. 72 volts and a peak output of 450 amps. This controller is meant for a series wound DC motor (or permanent magnet DC motor) because it only has one pair of motor terminals. It can only control current on one circuit. Here you can see the problem: with a sepex motor you have to control the current on two separate circuits. Part of me wanted to purchase a sepex motor controller...until I saw their prices. The cheap (frugal?) part of me decided to try to make do with what I already have. With a whole bunch of research I have concluded that putting a constant 12V to the field windings (which will draw approximately 10A) and controlling the armature winding current with my 7245 controller should work. Should work. I have exactly the same issue so will be interested to see what you find. One thing is that you really want to only turn on the field when you want to drive, because the rests at traffic lights or whatever will give the field windings some time to cool down. If you don't mind I will link your post on a UK site (ev.forumchitchat.com) where a couple of people have reported blown sepex controllers and will be interested in this.